Living in an area where the most heady crime is toilet paper strewn through trees and cacti, this is always a bit disturbing. I’m left to wonder what delinquent youth has it out for my holiday gourds. Perhaps they didn’t like our Halloween candy? This year, not only did they take it out on the pumpkin, but the careless ones also backed up into my herb garden which really kicks into beautiful growth this time of year. Sneaky as they are, I was prepared for the vandals this year. With an out of sight camera tied to a motion detector we waited patiently for the unruly clan to make their raid. And don’t worry, I wasn’t going to turn them in – the plan was simply to invite them back for clean up the next morning – really early. So when I woke to find pumpkin seeds strewn across the porch, I grabbed the camera to unveil the culprits. A pack of wild javalina! Here they are! Not at all what I was expecting and despite the damage, I’m a bit tickled. This is a pack of wild pigs called Javalina that live in the desert. We rarely see them but clearly they know when it’s pumpkin time. Javalina are also referred to Peccaries or skunk pigs – the latter nickname for their pungent odor. They travel in bands of 15 or so and warn away predators by gnashing their teeth. Mystery solved. Lesson learned. Keep an open mind. Enjoy the tune. Do you have them where you live Charlie? Wow! Javalinas! Maybe that was our pumpkin thief the whole time!? I would bet on it. It clearly has been my thief the whole time. I didn’t expect it either and it really is a good lesson in challenging our own assumptions Debbie. Nice job catching a photo of them! It makes sense though that they would do that! I really had no idea that they’d eat pumpkins. Now you know what happens to those pumpkins. And Tammy, OH MY GOD! 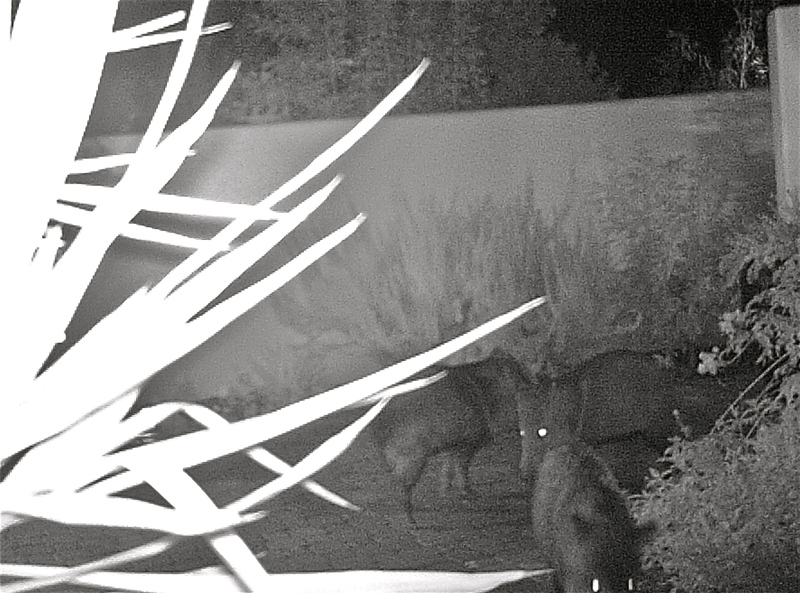 Wild Pigs in your garden? I want to tell you its exotic, but im more tempted to tell you, don’t ever think of having an early morning walk. Yes, I’m a bit afraid of them – especially if there were 15! Great story! Love the Smashing Pumpkins, it’s been ages since I’ve heard one of their songs. Oh, my . . . don’t let the dogs out. Don’t. Don’t. Pumpkins! Who knew? Definitely not me. Clever, Tammy. A few weeks back, we had a rescue dog come over for a one day visit. I left the house for 30 minutes and came back to find the place in disarray. I knew he had gone on a tornado style rampage but had no proof. I laughed about it later with our vet, and she said she wished we’d had a camera set up, in particular to find out how a dog with 6-inch legs could have leapt onto the kitchen counter to steal butter from a butter dish. Wouldn’t you just love to see it? Oh and butter! You can bet whoever was around that dog later paid dearly for that. I once turned my back on a brick of cream cheese only to find it had gone missing and I remember the outcomes well. That’s funny Tammy. And I’ll bet you were even giving some neighborhood juvie suspect the stink-eye, lol. I grow pumpkins to feed my pigs & cows… the pigs in particular love them. Just had no idea about that! I was suspecting an animal, as the white-tail deer will occasionally break a gourd to get at the contents and even small rodents will gnaw at them. I never suspected wild pigs! That is humorous, but also a little frightening! Great story, thank you! I haven’t heard of a person being hurt by these but they would startle me if I ran into them. great detective work! little javalinas, who knew? a good lesson in assumptions, and the unexpected! Let me know how it goes. Where in Northern AZ? There are critters everywhere. Fascinating, I’ve never heard of or seen them before ! It surprised me that’s for certain. Awesome! Like the raccoons in my hood. So destructive. Who would have thought? I was getting upset until I saw the picture. Frame it. It is worthy! I didn’t know they would eat pumpkin. Oops…I would have blamed the Trick or Treaters too. That is one unexpected culprit. How you discovered them is just amazing. Advance Happy Thanksgiving. So nice to know that the trick or treaters were not to blame. Ha ha, they are lucky not to have been turned into supper! I wonder if they are edible Tandy. Off to do some research. Great suspense and detective work! 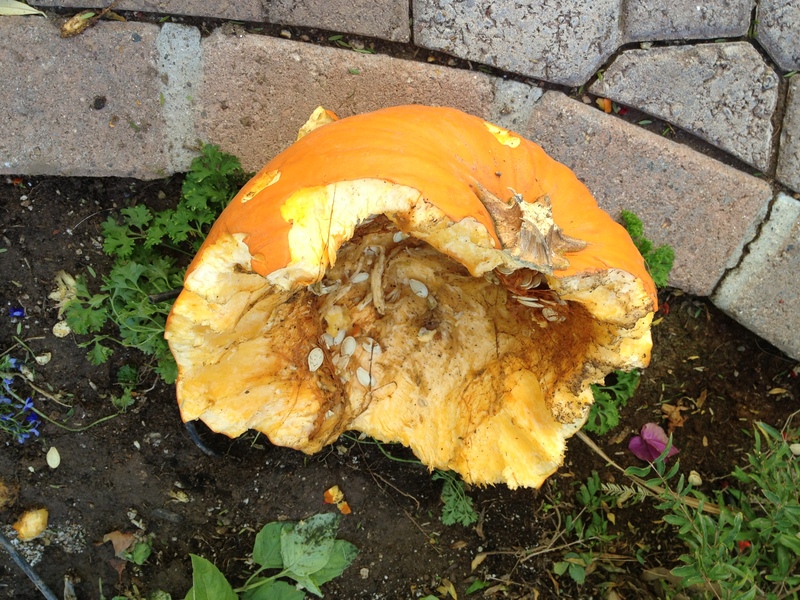 And come to think of it, while we don’t have any big pumpkin eating wildlife, many years I have had small critters gnaw through the shell to get the seeds (though then the culprit is more obvious). Guess, I’ll learn not to leave them out. By the way, I’ve purchased several small ones ready to be stuffed. We don not have wild hogs here, but I know how destructive they and can be!! And mean…………. I loved that band! I saw them 2 at a Summer’s popfestival in Belgium! I love that song too! Waw! You have wild pigs roaming your garden’s & streets !! Thta’s awful! You must caught them & roast them! It is game season anyway! I don’t know if these pigs would be good to eat but the band is great. Good to know you like them too. Ya, I loved smashing pumpkins the band, when I was younger. This story is amazing, tho, too. You’re a great detective. I would have suspected teen-aged vandals myself. We did have some human pumpkin vandals in our quiet neighborhood. We discovered that our mailbox had been smashed in with a pumpkin, as were two other mailboxes in the neighborhood. We found the smashed pumpkins in the driveway. I’m guessing that the culprits drove by very quickly and lobbed the pumpkins at the mailboxes from the open window. They had very good aim, I’ll give them that. I once grew cantaloupe in a garden at another house, but I never got any. Some creature opened them and cleaned them out completely, leaving only the rind. I’m actually happy to know that it isn’t teenage vandals although we did have a mailbox issue like you were discussing once. What do you think ate the canteloupe? I’m guessing that a raccoon or two ate the cantaloupe.